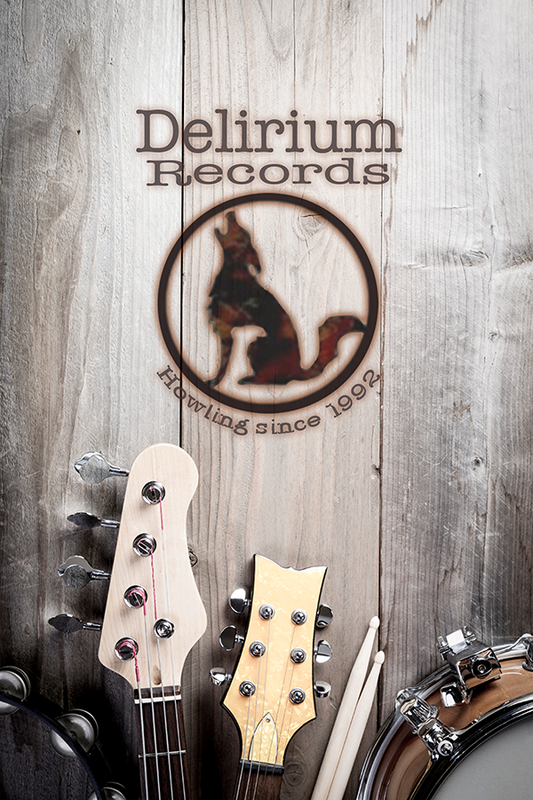 Delirium Records was founded in 1992 by independent music marketer and record producer Curt Sautter. Delirium Records evolving from IMC, a street-level music marketing and artist consulting firm. IMC worked closely with artists on professionally presenting the artist and their image as well as refining the direction of the artists’ music. By 1992 it became apparent that creating an independent record label would be the next step. Having been involved in the early Los Angeles Punk music scene and an avid music fan, Curt had a great respect for LA Punk/Independent record labels Posh Boy, Frontier Records and Slash Records. These labels found talented young artists and produced quality records from the emerging Southern California music scene in the late 1970’s and 1980’s. Sautter understood that good quality recordings are needed to properly present an artist to their potential audience. Even though most of the albums released by these labels never reach the mainstream they did, however, create an influential chronicling of underground music. Many of the artists through their recordings were able to influence generations of musicians. Curt Sautter wanted Delirium Records to become a launching pad for quality music that might not be heard otherwise. Delirium was never designed to overthrow the music business as many indie labels in the 1990’s thought they would do. Delirium Records sole purpose is to make quality music available to those music fans who strive to find new music. With the success of independent record labels like Sub-Pop indie labels popped up everywhere thinking that it was easy money. Within a few years and even months, these labels fell off the planet due to their sole purpose was money not art. Curt had met the owner of Diesel Only Records during the first couple of months of Delirium at South By Southwest in Austin TX. Jeremy Tepper was excited about his label and the music he was releasing. At that time, all of Diesel Only releases were on vinyl. Someone asked how much money he was making and Tepper replied that the money was negligible, but he got to work with some amazing artists and be a part of giving life to some great music. People scoffed at him but what he was saying made perfect sense to Sautter. It was kind of one of those ╥if you build it. They will come╙ kind of things. Make good music and be a good person and what matters will be taken care of. The following year at South by Southwest Curt spoke to Dave Hayes the founder of Doctor Dream Records. Sautter had been acquainted with Hayes in the pre-Doctor Dream years. Hayes had played with a friend of Sautters in a high school band called World 32. Doctor Dream Records had been another independent record label that Sautter admired since they put out quality recordings of multiple genres. In their conversation Hayes and Sautter discussed how being a part of good music was the goal and that labels that sought huge profits from each release only ended up unhappy and all soon closed once the reality sunk in. One of the other elements that would set Delirium Records aside from other indie record labels was the concession decision to seek out quality song writing and to not only stick to one genre. In a world of strict branding this is a dangerous business decision. Sautter felt that to truly bring good indie music to life sticking a one genre would severely limit the artists he could work with. Delirium did choose to work with live performing type artists and to stay away from producer based genres like Rap, Hip Hop and R&B which required a different type of distribution system and much more upfront financing. After working with a several artists without a release, Delirium Records finally released their first record in 1994. This was a four song ep by the Orange County California band The Globe. The Blue vinyl ep was titled Hi-Fidelity Garage Pop. The Globe mixed power chord power-pop with synth-pop and a knack for lively lyrics. Delirium would continue to work on a full length album with the band until the bands break-up, leaving the albums material unreleased. The next two releases were also on colored vinyl. The Punk-Metal band the Hoodlumz and the melodic punk band Organized Crime in 1995 and 96 respectively. In 1997 Delirium started teaming with other labels to release artists jointly. An alliance with Santa Monica California based Motion City Records led to this release of Cyberspace Cowboy by the indie rock band Velvet. The next release would be the first full length album and the first of several albums by the Southern California Rockabilly band Danny Dean and the Homewreckers. It was during the summer of 1998 that Sautter was working on a way to deal with the issues that faced independent record labels. Late one night while reading a Southern California music magazine, Mean Street, which had a directory of So Cal indie labels Sautter decided to try to build a coalition of indie records. After reaching out to several labels Sautter invited willing labels to get together to discuss the issues that they all faced like distribution, the costs of press advertising and manufacturing. The labels in attendance included all levels of indie labels from those without side funding to those that created CD-Rs for their releases. After three gatherings and led by Sautter and Slog Records owner Chris Suchanek Independents Anonymous was formed. Using the collective force of eight indie labels Sautter and Suchanek were then able to secure national distribution and a discounted manufacturing cost for all labels. Independents Anonymous would also purchase blocks of advertising and do joint advertising with the Independents Anonymous labels collectively. Independents Anonymous would release a string of tribute albums featuring a collection of the collectives artists using Delirium Records as the releasing label. These tributes would include a tribute to the Pretty in Pink soundtrack as well as tributes to the music of U2, Madonna and Neil Diamond. One of the primary promotional points of all these albums were that the artists would record the songs, as if they had written it, it their style. In 2006 after the landslide of retail record store, distributor and record label closures, that lasted a couple of years only a small fraction of indie labels nationally survived. Delirium Records remained strong but with the closure of many of the Independents Anonymous labels, including Slog and Motion City Records, Independents Anonymous stopped working as a collective. Delirium Records would continue to work with artists who had been affiliated with Independents Anonymous labels, including Statica, who was affiliated with Motion City Records and Tom Racer with had been on Slog. Throughout the late 1990’s and 2000’s Delirium Records would release two albums by Sautter produced Power-pop band the Relatives and three albums by Danny Dean and the Homewreckers. After seeing so many independent and major labels closing in the early and middle 2000’s Sautter rethought the direction that Delirium was heading in and decided to return to the original basis for Delirium, which was to record and make good music available to those music fans seeking fresh new music. The first of these new projects would be two albums by the former Doom Kounty Electric Chair bassist Chris Cruz. Sautter and Cruz would spend one day a week for sixteen months recording twenty-two folk rock songs. In 2010 Sautter and Delirium started recording new material by the reformed Hoodlumz as well as plans for a new series of tribute albums. If you would like to help keep indie music alive please purchase a song download or a CD to help the cause.